I’m Mark Wilson and here is my version of an About page. Actually its pretty much a normal About page with a different title. 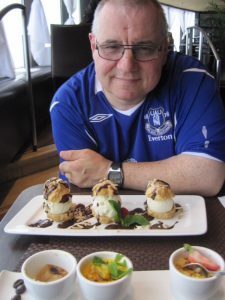 What can i tell you, this is a website which essentially is all about my life as a bluenose, or fanatical Evertonian. Integral to that are a few things which don’t define me but are very much a part of me. So if you are really pushed for something, lets be honest anything, to do after watching paint dry, you may well read about my take on Everton’s latest attempt to behave in simply the most Everton way, ever, alongside stuff around me being a no legged one armed power chair using guy who used to walk on two tin legs for a lifetime and now doesn’t, walk that is. Theres a past working life of 35.5 years with one public sector employer, where i led commands of 500-1200 staff and managed an annual budget of close to £20m+. Or as my team used to call it, generously allowed them to do all the hard work, and keep me out of trouble with Ministers, CEO’s, my Regional Director and the public at large. This would be classed at an Appraisal as only “partially achieved”. There is a lot about disability, or impairment as i know many feel it should be called. I am a bit old school disabled, being quite old, but a real fan of the social model of disability so well up for discussion about the language of disability, disabling environments, disability politics and any issues that impact those of us who some seem to blame for a lack of world peace, the crash of 2008 and Donald Trump getting elected. My Bluenose Life includes early retirement, very early retirement. It has a new element of me as a Social Media Manager & Website content mgt, mainly in a volunteering capacity for a number of local charities and one very big national charity which has lots of green, everywhere. So you might see a lot of stuff about the fantastic Ronald McDonald House at Alder Hey Liverpool, and strategic work on volunteering at Macmillan Cancer Support (thats the green reference) and my role as a Trustee on the board of Warrington Disability Partnership. You could also wander across some politics and it won’t take you long to see I’m a guy waiting for someone to create the political party i want to join, which is a UK version of the USA’s Democratic Party only more successful at keeping people like Donald Trump from ever taking public office – there he is again. My wonderful family will probably feature, as will accessible travel, foodie stuff and my love hate relationship with Slimming World Syn values. In other words, I’m slowly building a website about me which is pretty much a recipe for a readership of one, but you never know who might land here by mistake whilst looking for words of wisdom or a laugh, or both.